Long before the Holden vs. Ford rivalry, before Custance broke inter-city motoring records, and even before carriages gave way to cars, an unsung inventor tinkering away in his Sydney workshop quietly made Australian motoring history. The ‘horseless carriage’ that he developed is believed to have been Australia’s first, a three-wheeler chain driven by a Daimler engine. A rigorous series of test drives around Johnston Street in Annandale revealed that the vehicle was prone to spilling petrol and catching on fire – not exactly roadworthy. Later that year, Charles fitted the cumbersome engine to a boat instead, thereby creating the first boat in Australia to run on an internal combustion engine. In 1896, Charles Snr and Jnr set about constructing a four-wheeler to improve mobility, using an air-cooled 3 h.p. De Dion engine and various technological innovations, such as a new carburettor. 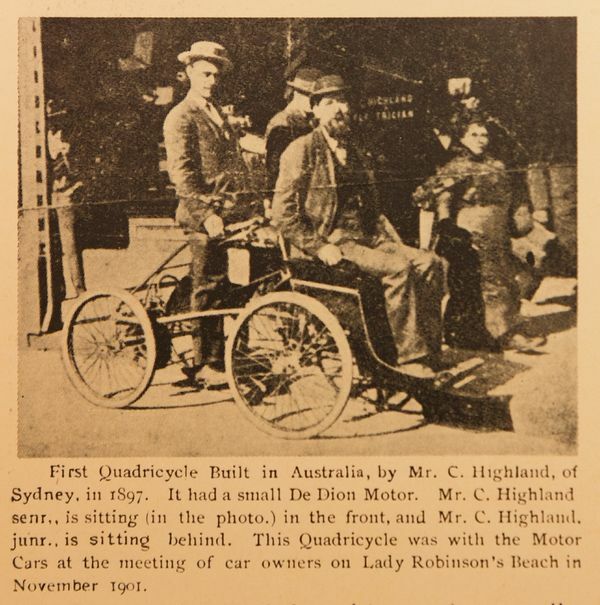 They enlisted the help of another innovative father-son team – George Winter Wood, known as ‘The Cycle Maker’ of Leichhardt, and his son George Wood Jnr – while the coach work was completed by Pitman of Redfern. In March 1897, the final product took to the roads. The vehicle, sometimes referred to as a ‘quadricycle’, was a notable success, facing few mechanical troubles. From Tooth’s KB Chronicle, 1 December 1935. Courtesy of Robin Amos. But was this Australia’s first motorcar? There is a surprisingly wide range of contenders for the title. David Shearer of Mannum, South Australia, was hailed as “Australia’s first inventor of a motor car” in the early 1890s. As The Mail reported on 10 July 1926, his was powered by mallee wood. The Powerhouse Museum notes that Captain Harry Tarrant of Melbourne is regarded as the inventor of Australia’s first petrol car in 1897. That there were so many contenders for this achievement speaks to the exciting, experimental spirit of this early period of Australian motoring history. Multiple competing claims, gaps in the material evidence and the sometimes minute technical variations between vehicles make it difficult to evaluate which exactly was Australia’s first. Then there’s the surprising trickiness of determining what exactly constitutes a car – is it four wheels? The engine? Running on petrol? All of the above? The oldest surviving Australian-made petrol-driven automobile engine, developed by the Wood team c. 1900. Courtesy of the Powerhouse Museum. At any rate, Highland is credited as the owner of Australia’s first four-wheeled motor vehicle, yet his technological innovations remain sorely little-known. Other innovations he accomplished include Australia’s first petrol driven lawn mower, first electric cutting and welding machines, and the first home electric light plant to be developed in one unit. The Tooth’s KB Chronicle states that Charles Highland was on the threshold of further discoveries when, “owing to coming into contact with various electric rays, he became seriously ill”. Tragically, Charles became bankrupt and, according to his descendant Robin Amos, was committed to the Callan Park institute by 1905. He died in 1908. “I think it is a real shame that someone who was so inventive seems to have been lost to history,” Robin says. Learn more about Australia’s transport history in issue 18, the transport edition of Inside History.